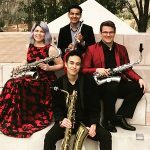 The Ladies Musical Club of Seattle will present three FREE concerts by the Zelos Saxophone Quartet, an exceptional ensemble from California, during the Puget Sound Tour for the Frances Walton Competition. Zelos is the proud winner of the ensemble division of the Frances Walton Competition. This versatile and engaging quartet performs repertoire including everything from Bach transcriptions to recently composed pieces, a dynamic and engaging group with a beautiful sound.